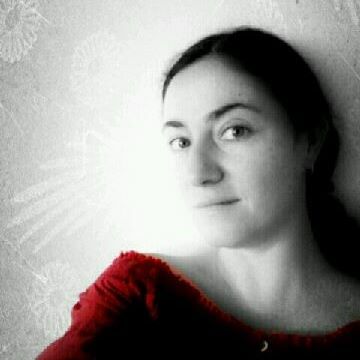 MIKHAEYLA KOPIEVSKY is an independent speculative fiction author who loves writing about complex and flawed characters in stories that explore philosophy, sociology and politics. She holds degrees in International Relations, Journalism, and Environmental Science. A former counter-terrorism advisor, she has travelled to and worked in Asia, the Middle East and Africa. Mikhaeyla lives in the Hunter Valley, Australia, with her husband and son. Divided Elements | Resistance is her debut offering. 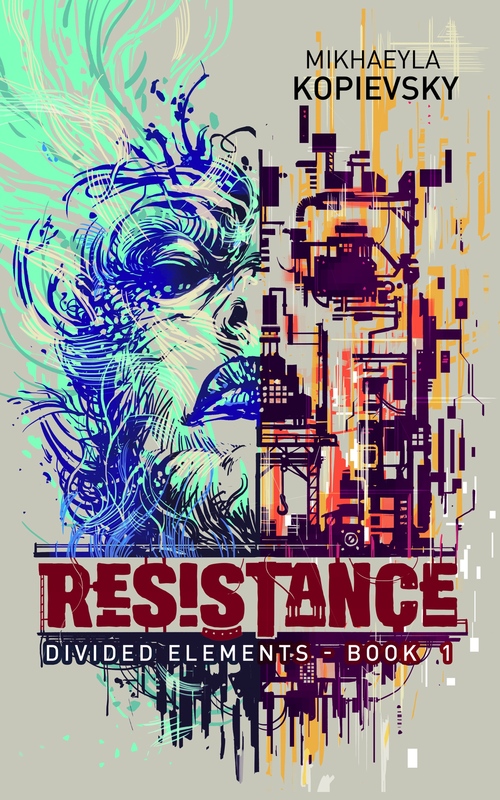 Resistance (Divided Elements #1) is the story of Anaiya 234 – a Peacekeeper of the Fire Element who patrols Otpor’s streets enforcing the Orthodoxy. In Otpor, a future post-apocalyptic Paris, life is a utopia – debauchery, security and stability are all provided by the Cooperative and maintained by strict adherence to the ruling ideology. Wrong action is termed Unorthodoxy and punished in a way similar to how crimes are dealt with in these days – retraint and detention. But, wrong thought – Heterodoxy – that is the real crime. Only once has the crime of Heterodoxy taken place, and the original Resistor – Kane 148 – was Executed for it. But, now Heterodox murals are appearing on crumbling Otpor infrastructure, hinting at a new rebellion. Radical measures will be taken to find and take down this new Resistance, changing life in Otpor and Anaiya, forever.2. 2, Why did you write your book? I started (and finished) writing this book for two reasons: 1) I needed to finally take my passion for writing seriously and commit to crafting and finishing a novel whose standard of quality I could be proud of, and 2) I needed to tell this story that calls into question humanity’s endless ambition to categorise society into us vs them, self vs other, familiar vs threatening. It is a theme that I am deeply passionate about – ignorance, xenophobia, intolerance and apathy are at the core of most of humanity’s problems. I believe if we focused on what we have in common, or on what our unique and individual skills, beliefs and perspectives can contribute, we would be that much closer to a more utopian ideal of humanity. 3. Who is the main character in Resistance? Anaiya 234 is a complex and flawed character. Many readers find her unlikeable at the beginning of the story – which is not surprising since she is so fiercely and steadfastly dedicated to fulfilling her Peacekeeper role. As a Fire Elemental, she is conditioned to have only a limited spectrum of emotions, to be practical and stoic – a finely tuned instrument in keeping Otpor citizen’s compliant and the streets safe. But, Anaiya has a shadowy legacy that follows her around. And when the discovery of new Heterodox murals gives her the opportunity to erase this legacy, she finds herself unable to say no. As the key player in the strategy to dismantle the Resistance, Anaiya is thrown into a new world where everything she has learned and taken for granted is suddenly called into question. Some of my favourite reviews of Resistance, talk about how much they love seeing the shift in Anaiya’s personality and the internal conflict she struggles with throughout the book. 4. Why do you think people should buy Resistance? This book is for readers who love the dystopian and post-apocalyptic scifi genres, but who want a darker and grittier story than what YA books are offering. 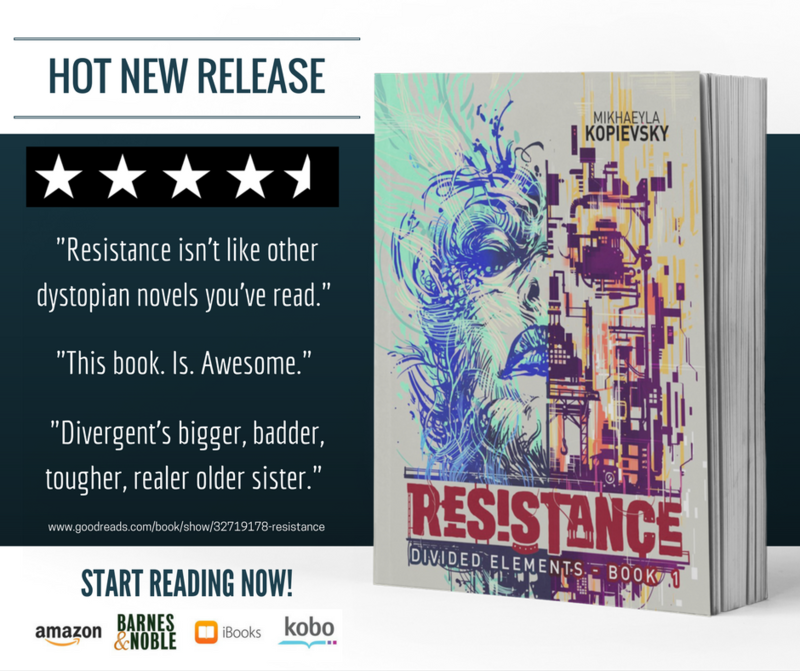 One reader called Resistance “Divergent’s bigger, badder, tougher, realer older sister”. While it will satisfy your need for the standard dystopian tropes, this book turns them on their head and puts them in a new context – in this story, the protagonist is not a hero, but a real and flawed character. And they’re not on a self-righteous path to bring down the Government, they’re actively fighting the Resistance while struggling with their convictions in doing so. If you like stories with interesting characters and dynamic world-building that will challenge as well as entertain you, then I think this one is for you! 5. What’s your favorite writing snack? I rarely snack when I write! I usually find that I get so immersed in the story, I either forget to eat or rush to pull together something very basic so I can get back into it! That being said, I do love to celebrate writing milestones with a nice dinner – my favourite is a local French restaurant (fitting, no?) where I could spend many a long, lazy Sunday brunch eating the charcuterie platter and indulging in a nice bottle of French wine! 6. What’s your favorite writing beverage? 7. If you were on desert island with just one book to read, what would it be and why? 8. Who is your go to celebrity crush? It was great to be interviewed by one of the first readers of my blog! You can read the original post over on Lit World Interviews, a great site which supports authors and introduces them to new readers. Thanks again for the opportunity to share my story! I hope you and your readers enjoyed getting a sneak peak into my writing process and life outside of books 🙂 I hope to see you all at the online book launch next month!